If you go and research the history of the Spanish name "Pineda," you will find that one of the meanings of the word is "pine forest." Yankee pitcher Michael Pineda has lived up to his name over the past two weeks. Back on April 10th, Pineda was caught by ESPN cameras with a wad of pine tar on the palm of his hand while pitching against the Boston Red Sox. By the time the message had been relayed to Boston's bench, Pineda had washed the substance off. 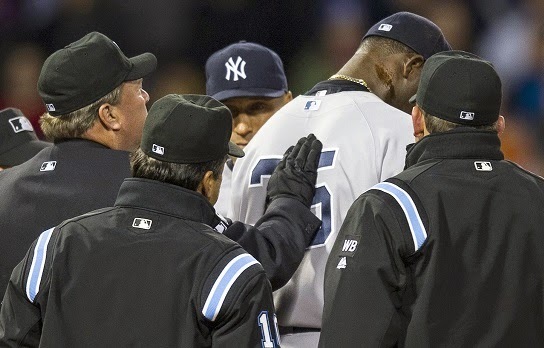 This past Wednesday night, in a rematch with the Sox, the cameras again saw Pineda with a large swath of the dark, sticky substance applied to the back of his neck. This time, word made it to Sox manager John Farrell in time for him to complain to home plate umpire Gerry Davis, who ejected Pineda after finding the foreign substance on his person. The next day, Pineda was suspended 10 games. To his credit, he has admitted guilt, not that he could've denied it. He had enough of the stuff on him both times to waterproof a house. Pineda also said he wouldn't appeal the decision. "I'll accept it because I know I made a mistake," the 25-year-old told ESPN. "That's it." The most disturbing part of this, at least for me, is the number of announcers, ex-players and news media who seemingly have absolutely no problem with the fact that Pineda cheated. Their only problem is that he did it so openly. I've heard both former pitchers and hitters say that the use of pine tar is commonplace, and how it's simply to help them get a better grip on the ball in cold weather, not gain an advantage by making the ball move like the old spit balls used to. Yet, those same guys will complain about steroid users and how they have destroyed the integrity of the game. Maybe I'm too much of a rule follower, but to me, cheating is cheating. If it's against the rules, it's cheating. If it's gaining an advantage through illegal means, it's cheating. If the rule book specifically prohibits something, it's not okay to do. They write that thing for a reason, people. When you work at a sports radio station in an NFL city for over a decade, you tend to get immersed in football 24/7, 365 days a year. In the past (in the weeks leading up to the draft), I've called this the NFL "silly season," because general managers, coaches, scouts, agents, players and the media are talking loud but not really saying a word. No one admits it, but everyone is lying this time of year, and it's fascinating to try and put it all together. In this day and age where essentially every Joe Blow can get access to a highlight film of a kid from Appalachian State, you have to use misdirection to get what you want. Let's look at all of these parties and figure out how they use the art of deception to their advantage. Obviously GMs have a lot to lose when it comes to the draft and their reputations. I've heard GMs spend weeks on end talking up certain players, but then when draft day rolls around, if you were to go into their "war room" that particular player is way down on their board or in some cases not on it at all. 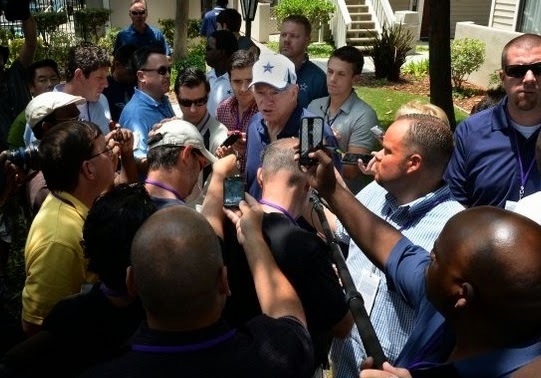 In the spring, some GMs will play things close to the vest and stay away from the media completely, while others will talk to anyone holding a microphone, but most of what comes out of their mouth is BS until draft day. Most coaches don't have the time to watch the college football that the GMs and the scouts have, so they might get a distorted view of a particular player. Also, coaches might talk up depth at a particular position, and then you look up on draft weekend and they have spent a high pick on a position that the coach hasn't talked about in months. Some coaches will target a guy and downgrade him in the media, then he ends up on the team. A case to watch for is new Vikings coach Mike Zimmer, who has seemingly gone out of his way to talk negatively about Johnny Manziel. If he takes him at No. 8 come draft day, everything he's said for the last 3 months or so has been bull; clever bull to get the other teams in front of them thinking. Whether you are the director of scouting or you're a scout just for a particular conference or region, you always want to be the person who discovered the small school guy or the undiscovered player on a SEC or Big 10 team. It can get your reputation up and keep you in the NFL for years to come. Scouts will often talk to the media and let them know what players they would never take and players who should be snatched up in the first round. Of course, most of it is done anonymously to get the mystery factor up. 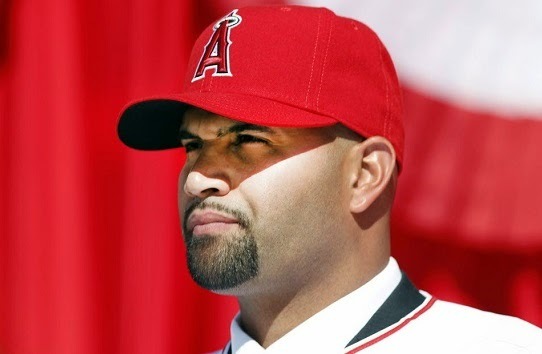 Is Albert Pujols Finally Earning His Huge Salary? Two years have passed since Albert Pujols signed his whopping 10-year, $240M contract with the Los Angeles Angels of Anaheim. A contract that even at the time (when Pujols was still one of the best hitters in the game) seemed a bit excessive. It wasn't just money, though. Pujols receives four season tickets to home games during the life of the contract, a hotel suite on road trips, the right to buy a luxury suite between first and third base for all home games and a luxury suite for the Pujols Foundation (his own charity) for ten home games a season. To top it all off, Pujols receives numerous incentive bonuses as well and will be granted $1M per year from the team for 10 years after the contract expires (or he retires), in what is coined a "personal services relationship" with the club. 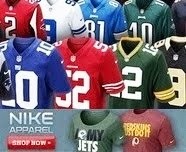 So why would any player deserve all this? Well the numbers speak for themselves. The 2-time World Series champion is a 9-time MLB All-Star, a 3-time NL MVP winner, a 6-time Silver Slugger Award winner, a 2-time Gold Glove recipient and a former National League Rookie of the Year. Amongst countless other unnamed accolades, No. 5 also has the distinction of being the only guy in Major League Baseball history to bat at least .300 with 30 or more home runs and 100 or more RBIs in his first 10 seasons. With a career average of .321, 500 home runs and all of the aforementioned credentials, it doesn't take a rocket scientist to see why the Dominican was so sought after once his contract with St. Louis had expired. What was hard to fathom is why any team would give a man in his thirties a hefty contract for a period likely longer than his career will be. Until now, the critics appeared to be right. Pujols missed 71 games in his first two seasons in California due to a nagging plantar fascia injury. His numbers were on a steady decline as well. During those first two years, he hit for a .275 average with only 47 homers. 2012 saw Pujols hit career lows in average and home runs. The following season only served to show him break those lows. As a hitter known for his ability to find gaps and hit for doubles, the 2013 campaign saw his lowest total in that department also. To boot, his once top-notch baserunning skills looked like a shadow of what they used to be, and even his value at first base, which was once high, dropped off significantly. Now I realize compared to league averages his numbers are still pretty solid. However, Pujols isn't an "average" player, and his contract certainly is not what I would call "average" either.